On April 6th, Afton Mountain Vineyards owners Tony and Elizabeth Smith celebrated ten years operating the winery under their ownership with an open house that featured a talk by Gabrielle Rausse, one of the Virginia industry’s founders, this writer (author of Beyond Jefferson’s Vines), a band and food trucks which provided a festive atmosphere. The anniversary had several levels: besides the ten years of Afton Mountain under the Smith’s ownership and management, it was 40 years since the first vines were planted by the previous owners, Tom and Shinko Corpora, and 30 years since their first wines were released. Some of the vines have been removed and new ones planted; cabernet franc will replace cabernet sauvignon, albarino and chardonnay will replace old gewurztraminer, but a new block of that popular grape for Afton Mountain Vineyards is being planted. There will be 25 acres total. Winemaker Damien Blanchon, a native of France, has been making the wines since 2011. The previous day, he gave a tour of the winery and some targeted comparison tastings to members of the media. We learned that the Smiths are committed to being a 100% estate-producing winery (growing all the grapes used in their wines themselves) and all the fruit is hand-harvested. Their capacity is 5,000 cases annually, typical of many (perhaps most) Virginia wineries, and they currently produce around 4,000 cases. They grow eleven vinifera varieties (Albarino and Tannat being the newest), but also make a methode champenoise sparkling wine blend of pinot noir and chardonnay, as well as a fine VDN (vin doux naturale) which is like port except it is not aged in new oak, and is made with Tannat. Although the winery is small it has progressive winemaking features, including being the first gravity-flow winery in Virginia, and two concrete amphorae which Damien uses for Cabernet Franc fermentations to avoid new oak extraction. The winery also has a composite “cellar” (sections of concrete tunnel) which are well-insulated with a very authentic atmosphere (80% humidity). 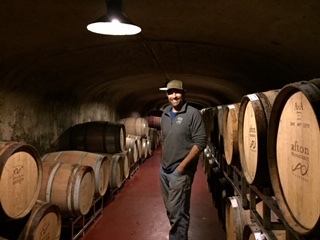 Afton Mountain winemaker Damien Blanchon in the winery’s barrel cave. Afterwards we tasted some very interesting and educational pairs of wines. First, we tasted two very different chardonnays; both were from 2018, the first was steel fermented and the second barrel fermented. These two separate wines will eventually be blended; the regular chardonnay is usually a blend of 50/50 of each component. A vintage comparative vintage tasting showed an impressive contrast. First, the 2018 cabernet franc which was light, fresh, clean, fruit-forward with raspberry flavors and bright acidity. The second was darker, with white pepper and black raspberry aromas with spices. On the palate, it was rich, lush and full-bodied; this was the 2017 vintage cabernet franc. There was nothing wrong with the 2018, but it was a dramatic stylistic contrast. In the tasting room, all the wines showed consistent high quality. My favorite wine was their **2014 Petit Verdot Estate Reserve. The name is appropriate, because the wine (from a fine, balanced vintage) was aged in oak for two years, then in the bottle for two years; as with fine reserve red wines in Europe. The nose reminds me of the Geyserville field blend by Ridge; mostly Zinfandel (74%) with Rhone and Mediterranean varieties making up the rest and providing needed tannin. There was a bouquet of ripe black fruits, herbs, violets and new American oak. On the palate, there were more solid ripe black fruits, firm tannins, and vanilla, with a long lingering finish. It’s still a young wine at five years, a great varietal example of a reserve style with Petit Verdot in a good vintage. Also impressive was the *Tradition 2016, a thirty-three percent blend of Cabernet Sauvignon, Merlot and Petit Verdot. On the nose, there are elegant earth/berry notes. On the palate, smoky dark fruits with full-bodied firm tannins, rich full fruit flavors. Despite the 33% Petit Verdot, the wine is elegant and integrated, and could be sneaked into a blind tasting of fine Medoc wines from Bordeaux and not be called out. Since 2011 there has been an elegant Arts and Crafts style covered pavilion opposite the new tasting room with a breathtaking view of the vineyard and the Rockfish Valley; visitors can bring picnics and enjoy the views while in shaded shelter, or sit outside with a view of the nearby lake behind the winery.